While I’m not a huge football fan, I’ll still spend nine hours watching every Sunday during the Fall. I feel compelled to watch no matter my feelings on the sport (too many commercials!) so an NFL lockout didn’t seem like the end of the world to me. It basically would have given me my Sundays back. But that won’t be the case for at least the next decade because “football is back”. That means SportCenter will be dominated by free agency, rule changes, training camps, preseason games and team predictions over the next couple of weeks. Fantasy football commercials will pick up en masse and most major stories on ESPN will relate to the NFL. 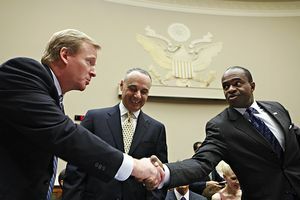 I’m not particularly looking forward to ESPN shoving an offseason full of NFL news down my throat in a month, but I do have to give credit NFL commissioner Roger Goodell and NFLPA President DeMaurice Smith. This was a pretty bitter battle that went back and forth a couple of times and led to the longest lockout in league history. But in the end, they got it done. • The owners and the players. Call it a tie. Each got a little something they wanted, and most important, each will get a lot of money. The owners now will keep 52 percent of the revenues, not the 47 percent from the previous collective bargaining agreement that so rankled them, but they also will have to operate with a $120 million salary cap, with an additional approximately $20 million for benefits, and have a guaranteed spend. That guaranteed spend was important to the players, and they got it. In the end, the owners and players are splitting more than $9 billion. No one is losing. That sounds exactly like how this sort of thing is supposed to work. Lots of bickering, months of proposals, counter-proposals and walking away from the table. Bring in the lawyers and the courts and make this thing as messy as possible. But when the season nears, each side sacrificed something and realized missing any games would be unacceptable. The Hall of Fame game is a big enough casualty in itself. So, props to Goodell, Smith and everyone else involved in these negotiations. They were messy and dragged on but we’re going to have a full season of football and everyone can be happy with that (If only people in Washington could learn how to give a little bit on each side). ‹ PreviousTalking About HoF for MLB Players Under the Age of 28? Really?